Two things that struck my eye on the interweb. This it true. Whenever I need to point someone to good monad tutorial, I point to the same paper without any doubt. Phil, what is the source of your brilliant and funny desktop background? I'd very much appreciate a higher resolution version. Rob, Sorry, I don't recall the original source and can't track it down. 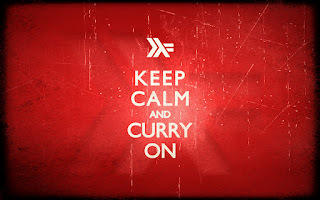 If someone knows the source of 'Keep Calm and Curry On', please say. If you click through on the image it is 800x1200, which should be adequate resolution. And here's the URL if you tried to click on the link in the image like me: http://homepages.inf.ed.ac.uk/wadler/papers/marktoberdorf/baastad.pdf. 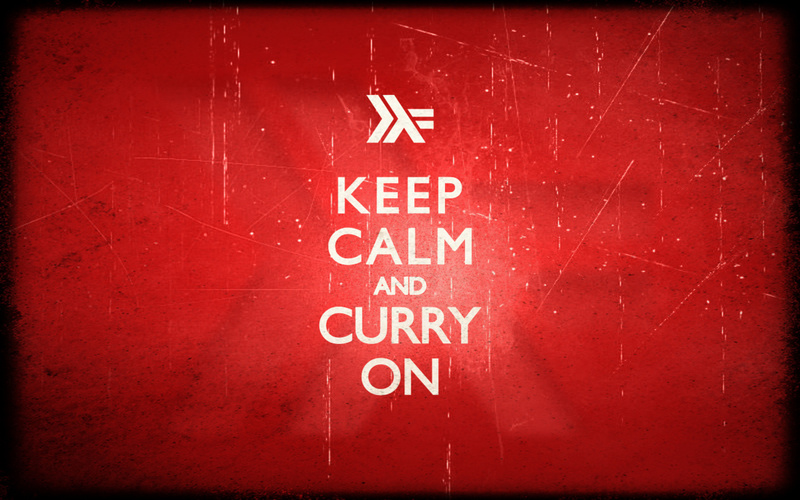 I've to admit the image is the funniest haskell-relaed joke i've ever seen. British sense of humour is the best. To be fair, I'm relatively certain the reason there are so many monad tutorials is because haskellers being smart folks recognize writing about something often helps to solidify in your own mind the topic. Sure you understand it before writing about it otherwise you wouldn't have written about it, but the act of explaining to another can really cement it into your own mind. Given smart folks know this whether formally or intuitively, and haskellers are apt to apply any learning tool they have in the constant pursuit of knowledge, I think an ever increasing number of monad tutorials is simply inevitable. That said, it's only inevitable that in time all haskellers will have written one. I'd go start mine now, but I'm unfortunately not as CMS skill level yet in haskell. Some day.